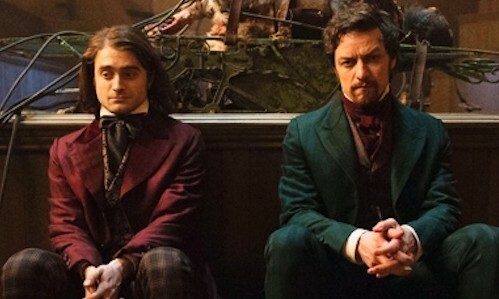 The very first trailer for James McAvoy and Daniel Radicliffe’s Victor Frankenstein has been released and unlike past adaptations we are getting quite the twist on the legendary story. In the trailer we see our two brilliant scientist Dr. Victor Frankenstein (McAvoy) and Dr. Igor Strausman (Radicliffe) in the lab getting prepared to embark on work unlike any they have ever done. Frankenstein lets it be known that they will be creating a man using dead parts of the human body, an idea that also has some consequences as the police are investigating these missing parts. Despite some doubts by Igor, the experiment happens but it goes horribly wrong. As we see near the end of the trailer all hell has broken loose now with this monster on the loose and the police are hot on Frankenstein and Strausmen’s tail. A seen in the trailer McAvoy and Radicliffe are joined by Jessica Brown Findlay from the Award winning Downtown Abbey. Other stars in the film include Andrew Scott, Mark Gatiss and Freddie Fox. The Movie is directed by Paul McGuigan, the script was adapted by Max Landis, and it is produced by John Davis. The movie will hit theaters November 25th. scroll down to check out the trailer.